As part of the activities for boys series we have here on the site, we went looking for the very best shark activities and we found some great ones. I can’t wait for you to see them. If you too are involved in all things shark, or if you are just looking for some fun things to do for shark week, this is the roundup for you. Sharks! Oh boy, I certainly remember the shark phase that occurred in our household. It was all shark, all the time for a while there. We read shark books, played shark games and pulled out all of our plastic shark figures to tell long involved stories. My poor characters died rather grisly deaths by shark attack. Along the way we learned that not very many people actually die by shark attack. Isn’t it great when kids have an interest that gets everyone learning all types of new things? Love that. This sensory bin is filled with water beads and . . . sharks! Learn the names of different sharks while playing bingo. Save those empty water bottles. This Shark Sensory Bottle is top notch. Enjoyable to make and super relaxing and mesmerizing to play with. Learn and lace with these very neat Shark Lacing Cards with added facts bonus. This Clothespin Craft Activity is easy to make and sure to get boys giggling. Think shark bites! I am in love with this Shark Game from Molly Moo and I am sure you and your boys will be too. The goal is to find the clown fish and not get stopped by the sharks. She includes free printable game tiles on her site. So nice! Here are some fun (and inexpensive) ideas if you are looking for more shark goodness. Enjoy these shark activities for shark week or at any time of the year. This is great! Sharks have been a hot topic here in NC. My kids think they are fascinating and I KNOW my boy will love the Lego set! Thanks for all these great ideas! My kids and I will surely have lots of fun doing these! Thanks Tine – so glad to hear you like them. Have fun! You always have such great activities for boys! 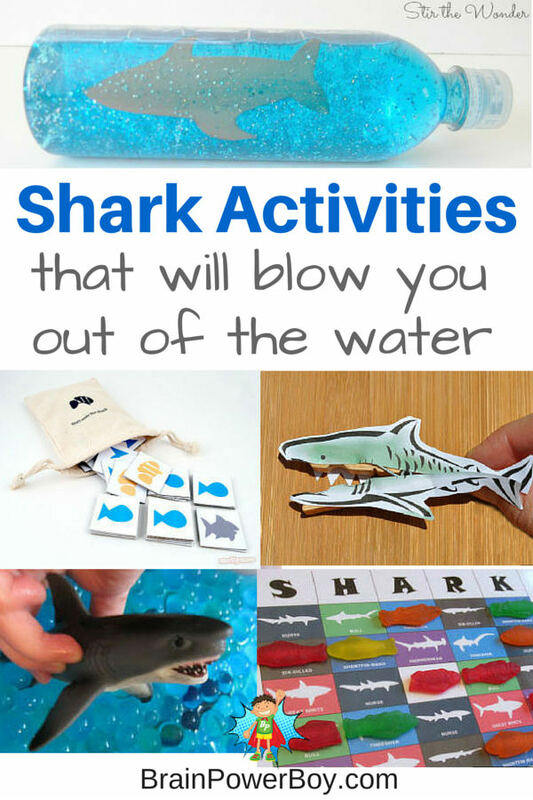 I love these all about sharks activities, and I think my grandson will too! Thank you Jann – you just made my day. I hope he enjoys them. I’m about to start preschool with my son and I could see some of these being very useful for learning about animals. He doesn’t get to watch shark week yet but his mommy and daddy are HUGE FANS of all things Shark Week. Thanks for stopping by Lauren. Yes, these could add some shark learning and enjoyment without the intense shark week moments. I’ve been looking for more sensory bin ideas so thanks for sharing that one! I’m going to check out some more of the shark activities too ahead of Shark Week. love the shark sensory bin! Thanks Susen – 3 Dinosaurs did a great job on that for sure. My 5 year old is obsessed with sharks, mainly because her dad is, so watching ocean related documentaries is something they do together on a regular basis. I love the shark peg, that can be something we can do so I can get on on the shark action =). Thanks for sharing! I know all about the shark obsessions! We went through that here as well. I hope you enjoy doing the shark clothespin activity together. Great ideas. I love that video for the origami shark. That will be perfect for my 10 yr old grandson. He learned about that in school but not how to do a shark. That will keep his attention for a while. Super! Glad to hear you found some fun things to do.